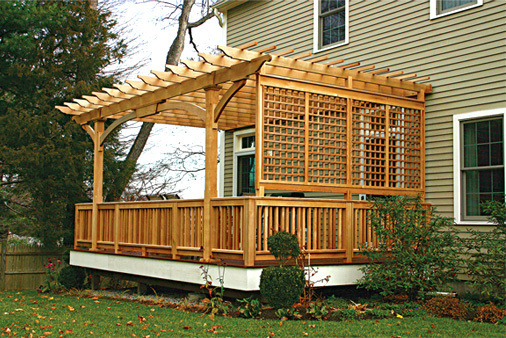 Your wood deck requires a little tender love and care. Unfortunately, many homeowners neglect their wood decks. As a result, these decks deteriorate much quicker, requiring expensive repairs or even full replacements. This week, we are going to address one aspect of regular deck maintenance: Deck Finishes. Believe it or not, your deck stain does much more than just make your deck more aesthetically appealing. Stain also protects your wooden deck from the sun. That’s right, the sun! The Forest Products Laboratory recently conducted a study in which they documented the effects of sunlight on wood. The Result: the longer unprotected wood was exposed to sunlight, the more damage UV radiation did to the lignin, the material that binds wood fibers. Lignin damage causes your wood deck to break down and grey. The Solutions: The above study found that sealed wood (painted or stained) maintained its integrity for well over 20 years. Doesn’t it make sense to spend an afternoon staining your deck? Just a few hours every year can help prolong the life and beauty of your wood deck! Stain and paint are your first line of defense against sun damage and inclement weather. So after you clean your fence, be sure to apply a fresh coat of stain or paint. But make sure whatever sealer you use is suitable for the type of wood that was used on your fence. Of course, if you would rather save time, composite or low maintenance decking is always an option. Low maintenance decking is a great way to enhance your backyard without the maintenance. This entry was posted on Thursday, September 13th, 2012	at 3:53 pm	. Both comments and pings are currently closed.